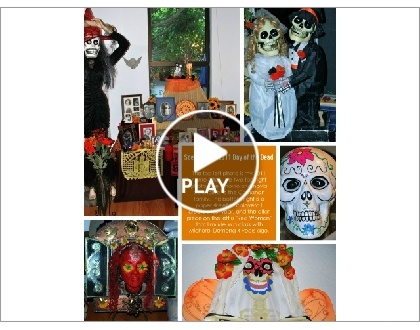 It's that time of year when some of us celebrate Dia de los Muertos or Day of the Dead. Because of large Latino population in California, we have our choice of dozens of celebrations this weekend, but in checking Mexican Sugar Skulls site (where I order 'stuff' for home), they have published events throughout the United States. Check and see if an event is near where you live. Unlike Halloween, where scary is the name of the game, Day of the Dead is a time of celebration for our loved ones who have passed from this dimension. Some of my friends will gather on Friday night for San Pedro's celebration, but the really big one is at the Hollywood Forever Cemetery. I really procrastinated putting up my own altar this year in part because I'm lazy, I guess, but maybe I just didn't want to feel the feelings. Last night I did build the ofrenda and now have to print out and frame four new pictures of dear ones who passed this past year. I'm grateful to my grandson Anthony because when he lived at my house while attending Redondo Union High School, all the students taking Spanish were required to build an ofrenda. My own school now has this activity for our Spanish students. This is my friend Mary Lou's ofrenda. Some friends gathered there to share photos and memories of our loved ones. I can never find marigolds for sale, the classic flower for Dia de los Muertos, but she found them at Trader Joe's and shared some with me for my own altar. My cyber friend Rebecca, who keeps the Recuerda mi Corazon blog, is in San Miguel de Allende right now hosting a Day of Dead tour for artists; she has been posting some great photos leading up to the day itself. Traveling with Rebecca in late October or during Holy Week is on my bucket list. My friend Vicki Hammond, an excellent collage and assemblage artist in Portland, OR, sent an e-mail with her photo regarding Valentine's Day today--and she put it on Facebook, too. Vicki's art blog is HerStory. At first I thought Vicki had written the paragraphs below, but all the credit goes to author Anne LaMott, she says. (I once was on camera few seconds when a documentarian was filming her for a documentary at the Sun Valley Writer's Conference.) This is what Anne wrote. Enjoy! We are all so pumped about Valentine's Day. You could cut the excitement around here with a knife. My first plan was to celebrate by giving the kitty a flea dip, and overeating, but I think I've come up with a better idea. Now, most of all us have some wonderful Valentine's Days over the years; or at least days that were not SO excruciating that we wanted to die. Which is at least a ...start. For instance, I had a wonderful man for seven years, who made me the most incredible little cards every year, but because he did not believe in climate science, or that there was any real difference between McCain and Obama, there were tiny tensions off and on the rest of the time. I would estimate that approximately 17% of people enjoy Valentine's day. Mostly, women will be given boxes of chocolates that they don't want and can't resist, and will be really mad at themselves for inhaling. Many people will be filled with resentment, anxiety, and guilt at having forgotten, or having shown up late, or having accidentally been having affairs with other people. Many people will feel a sheet-metal sense of loneliness and rejection. They will be comparing their insides with other people's outsides, especially those happy valentines actors in advertisements and commercials. So let's start an Occupy Valentine's Day movement. Let's begin with the premise that another word for Valentine's Day is Thursday. And on Thursday, as an act of radical self-care, we will celebrate the miracle that a few people love us SO much, that we can go on, and bear up, no matter what; that even though they know the darkest, most human and intimate and disgusting stuff about us, they still love us. In fact, they love us more and more through the years. This is so wild, and is really my only hope. It is what salvation looks like. A handful of friends is the reason my faith in God is so deep. Because they ARE love; they (along with the dogs) are my most obvious connection to divine love in this joint, the looks of love on their faces. Let's celebrate that all you need is love; and that God is Love and love is God; that Love will heal ALL, although unfortunately, maybe not on our time--ie by Wednesday, right after lunch. But it will. When all is said and done, Love is sovereign on this earth. So let's go crazy with love on Thursday. If we want to be filled with loving feelings, all it takes is to do a bunch of loving things for others and ourselves. That's all it takes! You take the action, and the insight will follow--that all you need is love. Crazy. We don't need to buy or be given a single thing, and we don't need to eat anything we don't really want. We'll just give each other secret love gestures all day. Okay? You in? Each year I hand make about 30 Christmas cards though I was late getting around to it this year. The Mary image is one I found on the Internet, but I altered it in collage layers on card stock. This is the letter I sent by snail mail--and now to you on the Internet. Click to enlarge. I am trying to find some free photo collage templates for use in making display boards for my work as an archivist at a school. When I started to Google and talk to the techs, I found little but was intrigued with Smilebox so I created this collage to practice. I have the full Adobe CS3 suite, but will have a learning curve there. Do any of you have freeware templates you can recommend? And, of course, this collage is for Rebecca's October La Calaca Love. Be sure to visit some of the work at other participants links. I know I won't have the time to do this the entire month, but I'll participate when I can. It's hard to know day by day whether to bundle up or take a chance on dressing up and catching a chill. Sophia and I decided we'd take the risk and let her prepare for Valentines Day. Have I ever told you I love gloves and hats? I don't wear them much, but I have lots of both and I play out my fantasies with Sophia. When you are older like I am, and live only with a dog and a mannikin, Valentines Day can be kind of sad--if you let it be. I choose not to get bogged down in Valentines past, but I'll admit I had some wonderful ones long ago. This article from Squidoo encourages you to make a senior your valentine. And, I'll admit, I would LOVE it if YOU make me (and Sophia and Mollie) your Valentine. Leave a comment or send an e-card. We would love it! Nothing like blatantly asking for what you want. You can never go wrong when you spend time with senior citizens and the elderly, particularly those who are homebound or widowed. For older folks, Valentine's Day may be a day where they feel lonely or sad, especially if their spouse is gone and they are living alone. It's easy to make a senior citizen your valentine - simply taking the time to send a card to an elderly relative may be very much appreciated. Even better, if you live nearby, take them out to lunch or dinner, or visit in their home. If you don't have elderly relatives or neighbors you personally know, you can drop off cards at a nursing home or retirement home in your area or volunteer to help there for the day. This is also a great day to ask about their favorite memories of Valentine's Day and what they've learned about love through their life - who knows, you might learn a juicy family story about Grandma and Grandpa's first date, or come away with some wisdom on what makes for a happy marriage. When I returned from church to my townhouse complex this morning, I started walking through the corridor before our gate and I had an ah-hah moment. This is the entrance to my beautiful home that I take for granted. I put my purse down, pulled out my point and shoot, and now I start my new year saying thank you, thank you, thank you. Am I lucky, or what? I live in paradise, or at least to me it is paradise. There was a time when I thought I'd open a spiritual bed and breakfast here after I retired and I named my place (at least to myself) Sanctuary Center. I even made a little sign that sits in the main window by the front door. But, instead I have continued to work part-time and now the aging me thinks that a b&b is more work than I'm willing to do. But, my home, Sanctuary Center, still exists in spirit; it has just morphed into something else. I long ago set the intent that solace and joy would be found here. Most of the 25 years I've lived here, I've had a housemate. All three of my children lived here off an on before they settled into their own lives. Three of the years two of my grandkids lived here while they finished high school. I have an ongoing journal workshop that has met here since 1990, I see an occasional spiritual directee here, welcome anyone who wants to do SoulCollage®, and four dogs during these years have found a home here. One of my former roommates still comes from Ojai one or two nights a week when she sees clients in her psychotherapy practice. My eldest son and his family come once or twice a year and Sanctuary Center welcomes guests who simply need a haven or a vacation sometimes. I have frequent house guests. To say nothing of how I have unfolded here myself. I was broken when I arrived--my long-term marriage had ended in 1984, my kids were largely out to school, and I had just begun to date. Breast cancer was diagnosed in 1989--and again in 1997. Who was I? Who was I to become? I knew who I had been -- a wife, a mother, a daughter, a sister, a friend, a community activist, a communications specialist. But, now what? When I was doing my journal new years eve year in review last night, a tradition I've had for many long years, I realized something. I long ago stopped dating as it became clear to me that a second marriage or even a long-term relationship was probably not in the cards for me. During the years I've truly been alone here without a man in my life (since 1997) I have learned to be alone pretty darned comfortably. I have a tendency to adapt to people, especially men; I am a rescuer by nature, but by living alone, with lots of time to think, to write, to create, to play, I've become Fran aka Redondowriter, the woman who keeps this blog and is very rarely bored. Sometime this past few weeks, when I've been off work and nursing bronchitis, I watched Dr. Oz and one of his guests said an old cliche, but this time I "got it." The past is history--the future is mystery--we only have now." To see other people's versions of Postcards from Paradise, visit Rebecca's Recuerda mi Corazon.